Multiple businesses in California (and even some homes) have the unfortunate pleasure of having aliens visit them, usually in the regrettable form of having a UFO crash into their place of business. Now, you'd think having aliens smash into your building and then rampage up and down your store would be a bad thing, but luckily for the visiting green men, most of the shop keepers seem alright with the intrusion. In Lathrop a 30 foot diameter saucer has crashed into their convenience store, just off of Interstate 5. The UFO's occupants, little green guys, have, of course, spilled out to cause chaos throughout the store, and can be seen doing things to milk, eggs, and other grocery items in many of the store's aisles. 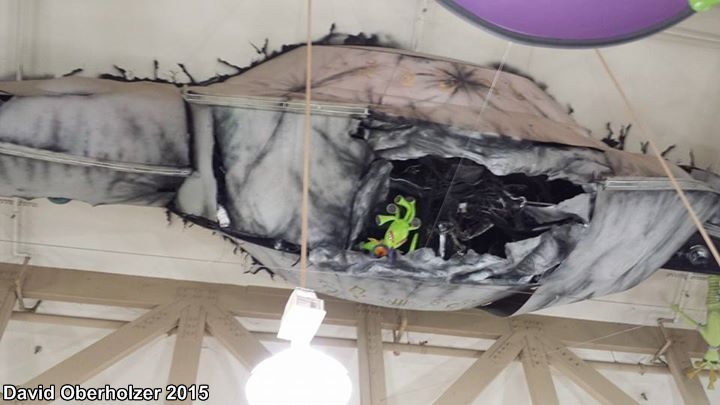 Additionally, you can see the other half of the flying saucer poking through the roof into the inside of the store. In Burbank, Fry's Electronics also has a flying saucer sticking out of its building above the entrance. Inside all sorts of aliens ranging from green martians to alien octopi to giant alien ants can be seen running around the electronics and computer equipment. The military has even shown up in the form of soldiers, jeeps and jet fighters in order to fight back the alien invasion. Out in the desert of Baker, the aliens aren't invading, they're welcoming you and selling you all sorts of jerky instead with flavors like Abducted Cow Teriyaki. The aliens can be found on the main street of Baker near the World's Largest Thermometer. Perhaps they used it as a landmark when landing their flying saucer. Not to be left out of the fun, Berkeley has a residence with a flying saucer crashed in its front yard. 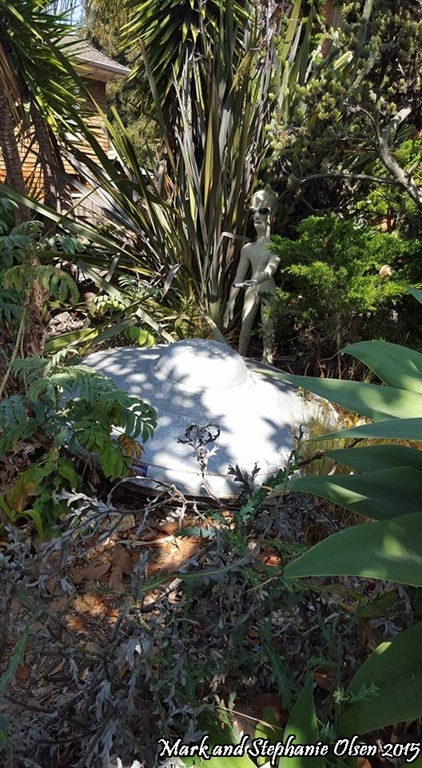 Located on Vine Street, the UFO has landed amongst ground foliage and plants. 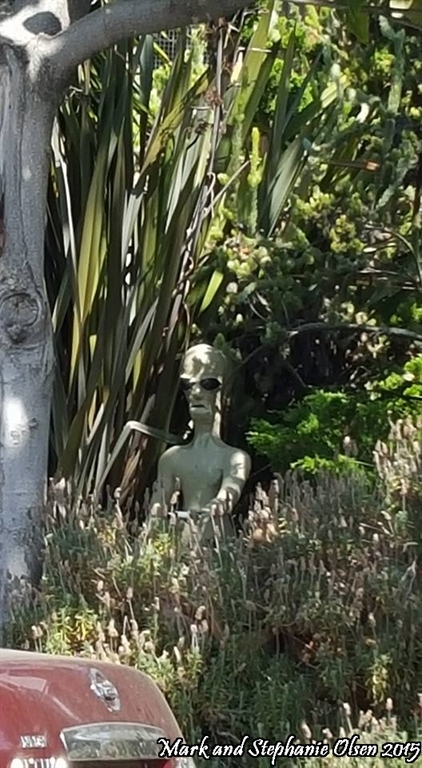 A lone alien has emerged from the spacecraft which sports a "Berkeley or Bust" bumper sticker. These photos are courtesy of Stephanie and Mark Olsen. 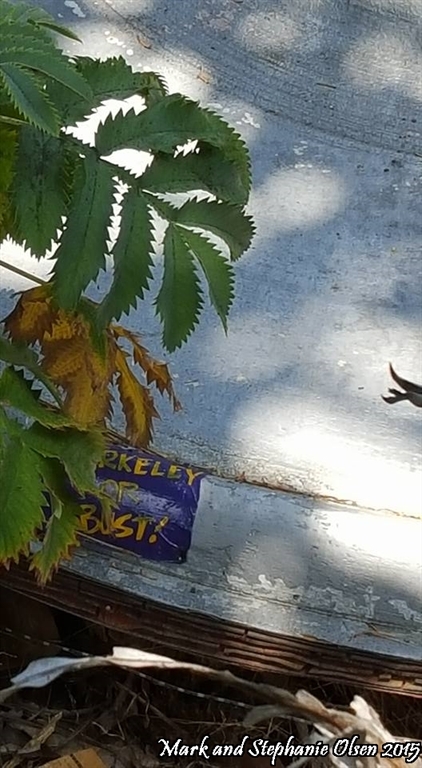 Berkeley has aliens visiting it! Part of Greg Brown's series of murals spread throughout downtown Palo Alto, are several aliens infesting multiple streets in the pretty area. A crashed flying saucer can be found on a wall in the parking lot. 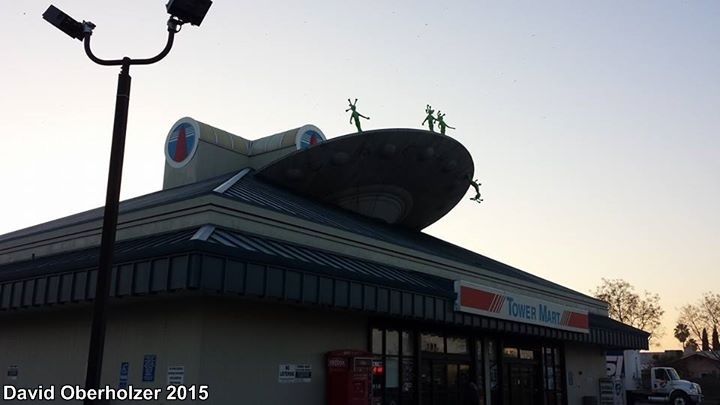 A few aliens can be found climbing some stairs on the opposite side of the parking lot. A garbage man collects a trash can with an alien peeking out of it, and even the Vice President, Spiro Agnew, himself, gets in on the alien invasion as he can be found pushing a stroller with an alien in it.